I have read there are three ways to separate an egg… that the first way is to use a commercial egg separator… the second way is to crack the egg and pour the egg yolk back and forth between the two shell halves… and the third way is to crack the egg into your open hand and let the egg white drip through your fingers. Here is my method… and it is a whole lot easier and less messy than any of the above. Gently crack an egg into a small bowl. 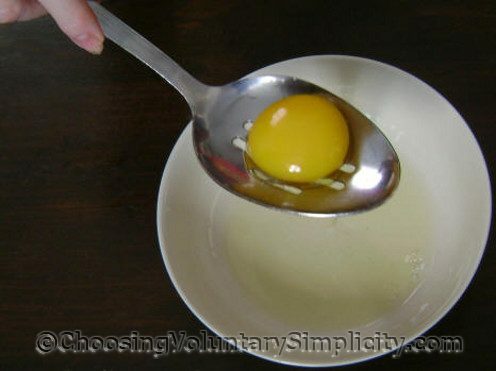 Slide a large slotted spoon under the yolk and gently lift up the yolk, leaving the egg white in the bowl. Hold the spoon and the yolk above the bowl for a few seconds, and the egg white that was around the yolk will break away and drop back into the bowl through the slots in the spoon. A slotted spoon also works great for picking up any stray pieces of eggshell. I have always wondered when we are supposed to be so careful about handling eggs why it is considered OK to pour the egg back and forth from shell to shell to separate the yolk from the white. You’re bound to get some contamination from the outside of the shell into the egg. Your method makes much more sense to me; thank you for sharing. I have a newborn and my time is no longer my own. I am concerned about salmonella and chickens and eggs and hand washing and I have found myself not making things that needed eggs to be separated because I might be in the middle of separating the eggs and need to do something with the baby. I love your method and I tried it yesterday and it worked wonderfully well. I separated 12 eggs for an angelfood cake and not a single one broke. 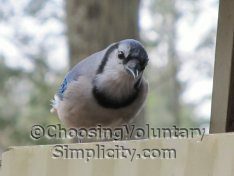 Great tip, great blog, thank-you! I was making a cake this morning that called for separated eggs and I thought it would be the perfect time to test out your method. The verdict: it works great! This is exactly the kind of thing that keeps me coming back to this blog. Thanks!